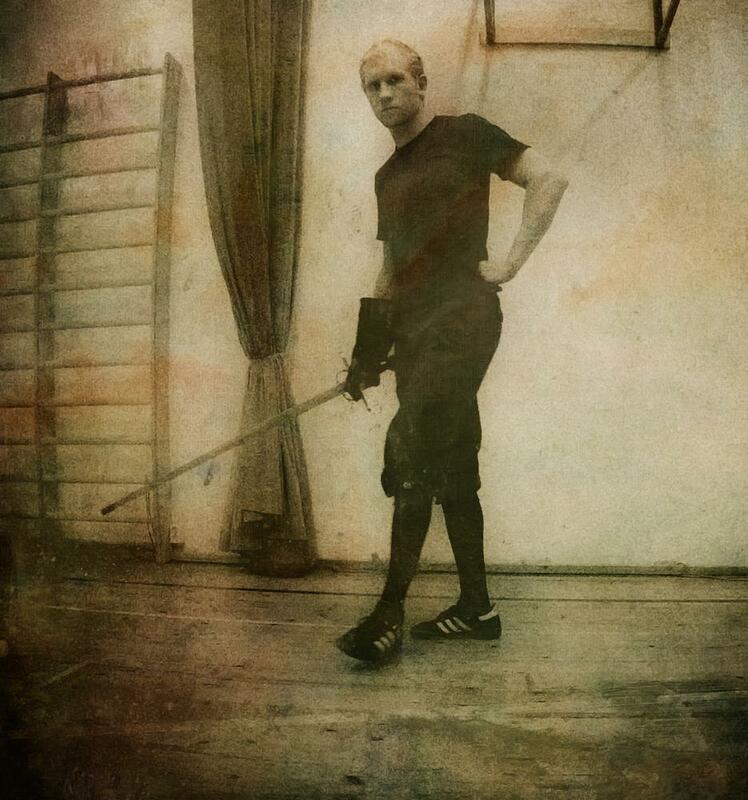 This is the first training sequence – an Assalto – created by Antonio Manciolino and published in his 1531 Opera nova specifically designed for use with a blunt training sword (spada da gioco) and a small buckler (brocchiero). By following these steps translated and punctuated into easier, digestible parts you can learn to perform the sequence yourself. Please understand that this represents my current interpretation of the sequence, and if you wish to familiarize yourself with the original text you can do so by downloading a facsimile or ordering an English translation. Notice that the Andare and Ritornare are to be performed on your own, as well as the Abbellimento, but the Giochi are in fact pair exercises though here displayed solo. The Abbellimento is repeated after each Gioco. At the bottom of this page is a glossary of the technical terms used. Read more about the Primo Assaltoin the blog. Passing****with left do a montante accompanied by a <span class="glossaryLink cmtt_Strikes" data-tooltip="
Pass long with right, striking <span class="glossaryLink cmtt_Strikes" data-tooltip="
Pass with right striking <span class="glossaryLink cmtt_Strikes" data-tooltip="
Strike the head or face with a <span class="glossaryLink cmtt_Strikes" data-tooltip="
Pass long with right throwing the fist high and striking a <span class="glossaryLink cmtt_Strikes" data-tooltip="
Pass with right, strike <span class="glossaryLink cmtt_Strikes" data-tooltip="
Pass long****with right backwards behind the left striking a <span class="glossaryLink cmtt_Strikes" data-tooltip="
Strike <span class="glossaryLink cmtt_Strikes" data-tooltip="
Pass with right, turning another tramazzone to the face followed by a thrust in GUARDIA DI FACCIA accomppanied by the buckler. Perform a strait of the half-sword, that is: pass long with right striking *<span class="glossaryLink cmtt_Strikes" data-tooltip="
Pass with right towards his leftfeinting a <span class="glossaryLink cmtt_Strikes" data-tooltip="
Pass backwards with left striking him with a half <span class="glossaryLink cmtt_Strikes" data-tooltip="
Pass with right backwards behind left cutting <span class="glossaryLink cmtt_Strikes" data-tooltip="
Strike a <span class="glossaryLink cmtt_Strikes" data-tooltip="
All instructions assume a right-handed fencer. Position of buckler can vary, but is by default extended toward the opponent. Swordhand to the inside, left foot forward. Presumed to be *stretta*, with point in line. Swordhand to the outside, left foot forward. With the point in line. Swordhand to the outside, right foot forward. With the point in line. Swordhand high above the head, with the point sloping forwards and down. Either foot forward. Swordhand high above the head, with point upwards or slightly back. Either foot forward or feet close together. Swordhand extended in front of face, with blade level to the ground and hand turned so that fingernails point up. Either foot forward. Swordhand high and to the outside, with point upwards and forwards so that head is covered from strikes. Either foot forward. Swordhand to the inside, right foot forward. With the point in line. A false *falso* done horizontally or across the target. A false edge rising cut. An action designed to provoke the opponent to parry, thus uncovering another target. A downwards strike with the true edge. A *Mandritto is a roof term for these cuts, but on its own it refers typically to a downwards diagonal cut from the right with the true edge, a mandritto sgualembrato. ">mandritto* struck so that the point does not travel past the center, but remains extended towards the opponent. A turn of the body (hips and torso) that may or may not involve a step. *Mezza volta di pugno*. A turn of the forearm from one side to another (for example from *coda longa* to *porta di ferro*. Likely analogous to *half-turn of the hand*. *Mezza volta di mano*. See *half-turn of the fist*. A descending, diagonal strike with the true edge, traveling right to left and going above the extended buckler arm. It is likely that the term either refers to or takes its name from the guard *guardia sopra il braccio* where the sword is held over the buckler arm with the point backwards. A descending, diagonal strike with the true edge, traveling right to left and going below the extended buckler arm. It is likely that the term either refers to or takes its name from the guard *guardia sotto il braccio* where the sword is held under the buckler arm with the point backwards. A false edge rising cut delivered directly upwards, whereas the *falsi* travel typically on a diagonal path. A descending thrust delivered from *guardia alicorno*, often referred to as an *imbroccata*. A thrust done with the hand supinated, delivered typically in a slight angle and on the left side in the position of *porta di ferro* or *guardia di faccia*. A strike travleing from left to right that is delivered in the manner of a push rather than a drawing motion. An action where the buckler is touched with the sword. Though not described in detail I interpret this action so that the buckler is beat with the pommel of the sword rather than the blade. Any strike traveling from left to right. An attack with the point of the sword. A downwards strike delivered with a wheeling motion of the wrist. A rising strike with the true edge delivered from left to right. At its fullest, it is an action starting from *guardia sotto il braccio* and ending in *guardia d’alicorno*.